As the core grows, available land is at a premium. But there are still little pockets of land that, while a bit challenging, could add great density to the city. We had talked about this briefly, but the thread fell off the site. 1. Monroe Avenue. Everyone is excited about the idea of liner buildings that surround a new parking structure on on Commerce. But what about the Government Center parking structure on Monroe. Not only is there space available in front of the structure, you could go one row into the parking structure and build vertically. Office/residential liner buildings with retail, bars and restaurants on the ground level. 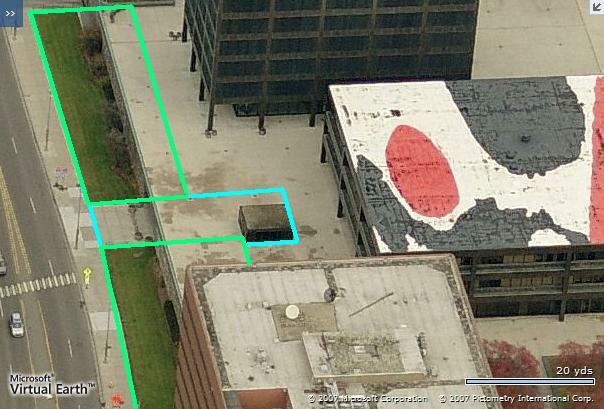 The city/county could also clean up that awful tunnel and stairway that and add a nice, welcoming entrance and stairway to their buildings (liner building footprints highlighted in green, city/county entrance highlighted in blue. I could easily see 8-10 story liner buildings, with the southern most footprint a little larger (and going deeper into the ramp). Space under the ramp could easily be sold with the development for condos, etc without the need for added parking structures. 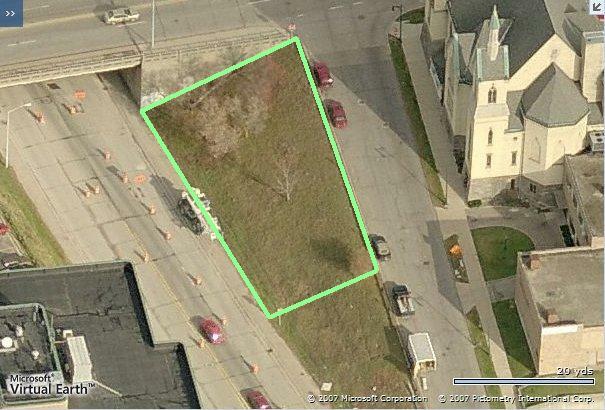 It also seems like an ideal tract of land to develop if the streetcars are heading up North Monroe. It would add more life to an area that needs it and help bridge the gap between North Monroe, Riverhouse/Bridgewater and the core. 2. Michigan and Division. There is a wedge along Division and Michigan that seems small and undevelopable, but when you eyeball it on the Internet, it is about 80x120x60x120. It is right in the thick of the development on Michigan Hill, and I think it would be a great place for an apartment building to serve all of the employees on the hill. The grade of the land would make it perfect for parking on the first and second level, with apartments above (and maybe a nice little bar/restaurant. So what does everyone think. 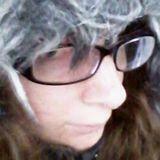 Developable? Impossible? Dumb? Impracticle? Personally, I'd like to see more infill and I think these spots are ideal. I think the also plug holes in what ends up being lonely, unused pockets of the city. I agree that it would be great to see some development/renovation on Monroe across from the convention center, but I don't think it will be happening anytime soon. I think if some decent projects were proposed for Olds Manor, the press building, or the postal service there would more demand along there. It seems like there is enough room to bring some nice shops right out to the sidewalk and create a nice little pocket of activity. You could even design it to encourage more people to hang out around the government buildings and Calder for a meal or something. I think I'd like to see the plot on Michigan and Division stay undeveloped or really low. It's nice to be able to see churches from several angles. But I'm always about planting native flora in spots like that-doesn't require mowing and brings more color into the urban core! There is a wedge along Division and Michigan that seems small and undevelopable, but when you eyeball it on the Internet, it is about 80x120x60x120. It is right in the thick of the development on Michigan Hill, and I think it would be a great place for an apartment building to serve all of the employees on the hill. The grade of the land would make it perfect for parking on the first and second level, with apartments above (and maybe a nice little bar/restaurant. On that MI and Div plot, I agree with landscaping. You could use nice boulders and plants to create a very nice area, or maybe a fountain and something to bring attention to "health hill". I like your ideas. They would be challanging projects because of the need to sway the city to sell you areas that are probably part of the road right of ways but they would make downtown feel much denser. I especially like the idea of a building on that triangular area near division. I agree with people that green space is important but that piece of land can't really be used by people anyway, it's an island surrounded by three roads and has a steep slope. Developing these small lots would make the parks in the city stand out and be appreciated even more I would think. I don't think that was the point. It was meant to be a dialogue on infill. Sure, the space could remain a weedy knoll between three roads. Or, it could be put to use. Maybe we should start a fund to ensure that our children's children will be able to frolic on such untouched virgin soil? I honestly don't even see a point in your post unless your just trying to be negative. It's fun to imagine better use of space, isn't it? For the others, I agree. Landscaping along any of these deadzones created by roads (including the one I mentioned) would be great. There is another spot right down the michigan hill on the north side of the road that would be a really cool place to landscape. Also, a lot of places on North Division. I really like the way someone put thought into the East Beltline. It's going to look really nice once all of the trees and plants mature. Must every inch of undeveloped land have something built on it? Isn't there some value to greenspace? I agree with Nitro - downtown is lacking in green space. In fact, I'd like to see the two buildings on the NE and SE corners of Division and Fountain torn down and replaced with green space. 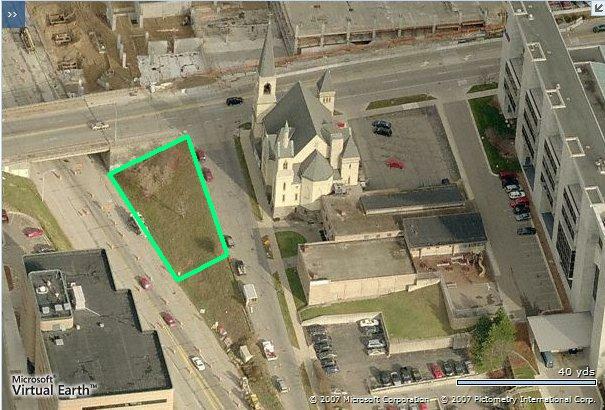 Imagine the great views of Fountain St. Church and St. Marks that would open up. 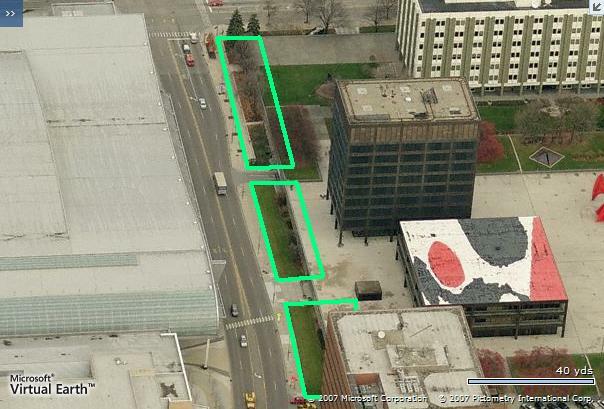 I do agree with the Monroe idea though - whether developed or reconfigured, the wall separating the City/County/Federal plazas from Monroe and DeVos Place needs to go. A while ago, GRDad came up with a proposal for that very spot and it was brilliant - perhaps he could re-post. To paraphrase Ronald Reagan, "...Mr. Heartwell, tear down that wall." I would love to see liner restaurants and retail along the Monroe side of the City county buildings esp. considering Devos Place. Imagine spending the day at a convention then popping across the street to grab a bite to eat or do a little shopping. I recently saw a postcard of Monroe (infront of DeVos Place) from back in the day and wow, what a transformation. Not a single building from the turn of the century still stands. Granted, waterfronts tend to have a lot of redevelopment in this day in age, but still, it would have been nice to have kept a few of those older buildings. They would have worked nicely for use in retail and restaurants. Now that I think of it, there's not a building left standing on the entire street of Monroe from that era. Yup, this is the one I was talking about. Something that invites people to go up on Calder Plaza (and for that matter, hang out on Monroe). Right now, to get to Calder Plaza, you have to go through a creepy tunnel, onto a creepy stairway to make your way up a level (I like the frog Mural, but it could be so much more inviting in that area). That would be something! Maybe I'll re-do it with the new birds-eye views. Here ya go Joe. 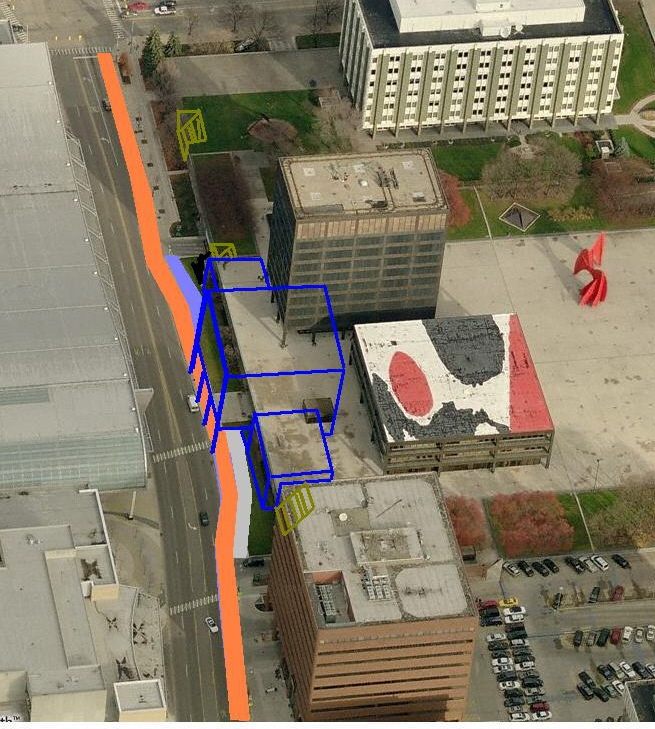 Orange is the streetcar line, blue is the new addition that would have an overhang over the sidewalk and streetcar "station", and gray would be the relocated sidewalk. I personally would love to see the Division triangle be developed. For one, I'm a sucker for flatiron buildings. Secondly, I think it could really help connect Michigan with N. Division and help bring some attention into that stretch. I nominate Calder Plaza seems like such a waste of space being used only for festivals during the summer. There should be more grass added and trees to make the area surrounding the calder a little more welcoming. Also the massive surface parking area surrounding Charlies crab.